Throughout the late spring, the atmosphere has beat a tune which was solidly in favour of a La Nina. Everything that has happened since: the unusually late damaging frosts in April; the warm start to summer followed by the more unsettled July and August across the UK; the heatwave across France and Southern Europe; the very active Atlantic hurricane season; the unusually warm October; and now, our cold end to November and start to winter proper, is consistent with a La Nine episode. The Tropical Pacific Ocean has belatedly followed this lead, and an oceanic La Nine event (lead by the atmosphere) is now in evidence. The atmospheric and oceanic signals are effectively coupled and highly cooperative with each other. Think of the winter time atmospheric response to La Nina being a tendency for ridges of high pressure across the central parts of the North Pacific and North Atlantic, most pronounced during November and December. So, how are we faring this November ? Well, the answer is an emphatic match on what La Nina should be delivering. Conventional wisdom is for La Ninas to be ‘front loaded’ for cold, that is colder to start becoming milder and wetter into the New Year. However, convention is not always the best way of putting a forecast together and I suggest that there are some compelling arguments making the case for a winter which might defy the convention, with a tendency for more frequent bouts of colder weather across Europe than we’ve experienced in the last five years. 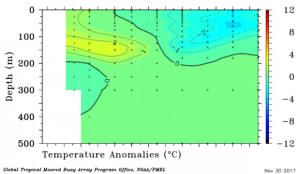 Over the last month, two elements of this La Nina have crucially altered. 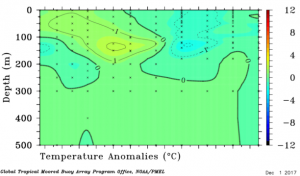 The core of the cold seas in the Equatorial Pacific have shifted eastwards. In response to this (although I suspect the atmosphere has choreographed this first), the atmosphere has begun to shift away from a classical La Nina signal. 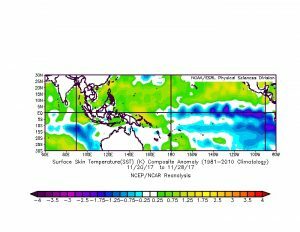 The colder than normal sea temperatures in the Equatorial Pacific have become more organised across the eastern part of the ocean. 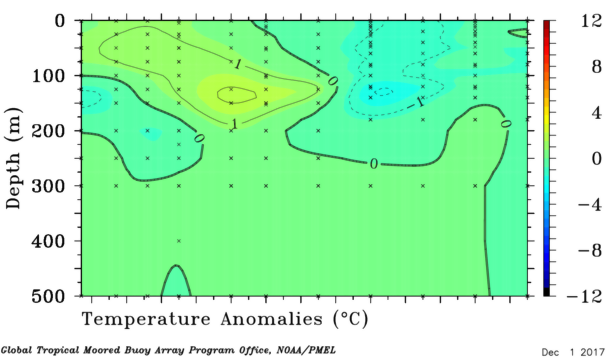 This is unusual for a La Nina episode reaching ‘maturity’ during the Northern Hemisphere Winter where the core of the colder waters tends to work their way westwards towards the central part of the Equatorial Pacific. For a La Nina event, this is an extremely ‘east-based’ spatial arrangement of colder than normal waters. This has happened a few times previously, notably 2005/06, 1954/55, and 1950/51 (as well as 1962/63 and 1995/95 to some degree but I won’t go there given the particularly extreme cold in one of these winters). 2005/06 is perhaps the best match, and the similarities extend to some depth in the ocean. The key point with this eastwards placement of colder waters is that it promotes a wind-flow pattern across the Tropical Pacific which is atypical to La Nina. Warmer than normal waters to the west and colder to the far east promote a convergence of lower level winds in the central part of the Equatorial Pacific. This convergence triggers deep thunderstorm activity and sets in train a wave pattern across the Northern Hemisphere. The location of thunderstorm activity this far east would almost be comparable with an El Nino event, and is supportive of a negative phase of the North Atlantic Oscillation, a useful broad-scale indicator of winter time European temperatures. All of this is theoretically fine if the atmosphere cooperates with this oceanic shift. The tentative indications, and I would stress at this stage these are still not overwhelming, are that the atmosphere is beginning to behave and respond to the oceanic eastward shift in La Nina. Regular followers and clients will know of the Global Wind Oscillation (GWO), a conceptual model to describe the ‘base state’ of the atmosphere. During La Ninas, the GWO is rooted in the lower octants of the spider graph (phases 1-2-3), whilst the warmer counter part El Nino is rooted in the higher octants (phases 5-6-7). Phases 4 and 8 are transitional stages where atmospheric momentum is being suddenly added (phase 4) or lost (phase 8). Thus far, the GWO has orbited in the lower portions of the cycle, typical of La Nina. In the last two weeks, there has been an uptick in the GWO towards phase 4, associated with an eastward tropical convective wave. If the atmospheric signal responds to the centre of thunderstorm activity being shifted further east than otherwise would be expected during a La Nina event (the Madden Julian Oscillation favouring activity in the Western Hemisphere), then thus would lead to a juxtaposition in angular momentum, effectively holding the equilibrium near average despite forcing towards the La Nina phases. This inherently an unstable position where the atmosphere will seek to continually adjust to pulling and pushing fro the two opposing drivers. This suggests that phases 4 and 8 are most favoured during December and January. Analysis of these phases is below with all years and La Nina years separated to see if there are significant differences. These broadly suggest a continuation of the mid Atlantic ridge – European trough scenario for December. This would lead to a colder than normal pattern across much of the Continent resulting in higher than normal energy demand. The risk of colder weather patterns across North America and East Asia is also elevated under this regime. For January, a subtle shift in pressure patterns across the North Atlantic occurs. The mid Atlantic ridge assumes less dominance and pressure tends to rise across Scandinavia and north of the UK resulting in a cold pattern continuing across Europe with more of an influence of easterly winds. To counter this, the atmosphere could slip back towards a more ‘traditional’ La Nina during the latter part of December and with a shift in the pattern of tropical thunderstorm activity towards the Indian Ocean. This would almost certainly choreograph with a strengthening of the winter time polar vortex and a shift towards a more positive phase of the North Atlantic Oscillation. Solar activity, whilst declining, still remains at moderate levels (in terms of planetary geomagnetic activity), which is a signal for a strengthening polar vortex. There are therefore some risks attached to buying into a cold scenario for the winter, and I would want to keep these on my side for the next couple of weeks to see where patterns of tropical thunderstorm activity develop. However, the best guidance comes from the winter of 2005/06, an east based La Nina event under similar solar conditions and other drivers. 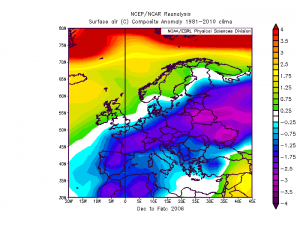 Whether the UK is able to tap into this cold is an issue, although the broad-scale signal at a European scale would tend to suggest an elevated risk of the coldest winter in the last five years is beckoning.